The Original Sherpa Bag is constructed in durable, quilted nylon. Front or top entry (U - shaped top zipper opening). Wheel safety strap slips over handles of a roll-aboard luggage or wheelies; also secures bag to a car's seatbelt. Extra rear zippered pocket for water and food. Mesh panels on three sides for assured ventilation. Includes faux lambskin lining. Reinforced bottom and handles. Adjustable shoulder strap (doubles as a leash). Folds flat for storage. • Front or top entry (U - shaped top zipper opening). • Wheel safety strap slips over handles of a roll-aboard luggage or wheelies. • Secures bag to a car's seatbelt. 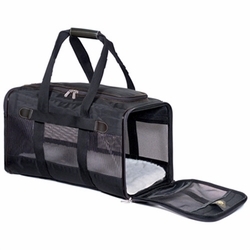 • Carrier Care: Spot clean with a damp cloth as needed. • Guaranteed on Board when using this carrier when flying most airlines.